Mark (Piolo Pascual), a man who lost everything, meets Carmina (Toni Gonzaga), a woman who lost the love of her life, one dark night. Both at the end of their threads, unexpectedly begin something -- a deal that leads to friendship, a connection that blooms into love. Does love go on? Or does it end with them? 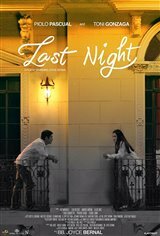 Will they choose to love even if it's the last night of their lives?